After their absences last week, SonicFox and Scar made their return to the Top 8 in Week 5 of the Mortal Kombat X Pro League. With these MKX legends back on top, balance seemed to be restored, but new competitors took down the returning champions and proved that the Season 3 throne is still up for grabs. In Week 4 of the MKX Pro League, Slayer was dubbed the “KingSlayer” after eliminating SonicFox and keeping him out of the Top 8 for the first time in Season 3. Week 5 began with a runback between these two titans. With some impressive Gunslinger Erron Black play, SonicFox quickly closed out the first match. Despite facing such a tough competitor, Slayer kept his composure and did the impossible, soldiering on to win three straight games against the returning champion and showing us all that his new nickname is well-deserved. DJT has been quickly rising to the top of the ranks with his A-List Cage. This week, he went head to head with a fellow YOMI teammate ForeverKing. DJT once again went with A-List Cage, which ForeverKing countered with his pick of Grandmaster Sub-Zero. DJT started off strong with a commanding first game, but a great change in adaptation led to a 2-1 lead for ForeverKing. After losing two straight games, DJT switched to Tempest Kung Lao in a final effort to turn the tides. ForeverKing then pulled out War God Kotal Kahn and edged out the win in Game 5, advancing to the semifinals. After a brief disappearance from the Top 8, Scar made his way back into familiar territory. This was the first Top 8 appearance for Kotal Kahn specialist Mr Aquaman who immediately set the tone by taking a 1-0. Scar refused to be eliminated early and took Game 2 to tie the set 1-1. Sticking with War God Kotal Kahn, Aquaman closed out the set 3-1, defeating the Pro League veteran in the second upset of the night. After defeating SonicFox for the second week in a row, it was clear that Slayer smelled blood in the water. However, his journey had only just begun as his next opponent was Dragon. Although Slayer seemed to prove dominant against most Alien players, Dragon has always emerged victorious in their run-ins. While Slayer took a convincing Game 1, Dragon eventually made quick work of him and took the set 3-1, advancing to the grand finals for this week. After ForeverKing’s great performance in the quarterfinals with Sub-Zero, he seemed confident going up against Aquaman’s Kotal Kahn and quickly gained the lead. In one last hope, Aquaman switched to the Cyber-Sub variation of Triborg to make a comeback and while he made a valiant effort, ForeverKing continued his icy onslaught to advance 3-0. 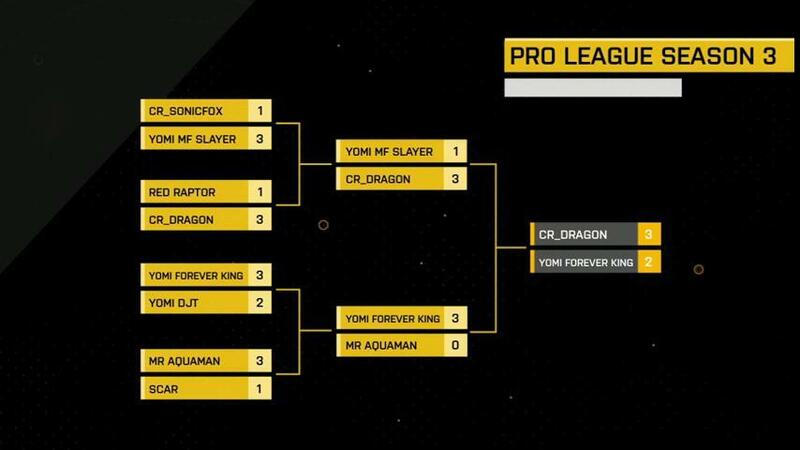 The grand finals for Week 5 of the NA Mortal Kombat X Pro League consisted of Dragon and ForeverKing. Dragon has been on an absolute killing spree, winning seven straight ESL Mortal Kombat X events. Eager to add another win to his record, Dragon dominated ForeverKing’s Tempest Kung Lao and took a speedy 2-0 lead. After going down two games so easily, ForeverKing decided to make the switch back to War God Kotal Kahn, which proved wise as ForeverKing showed resistance by not only taking a game off of Dragon, but tying up the set 2-2! With the momentum shifting in ForeverKing’s favor, victory seemed to be within arm’s reach. Dragon was not ready to end his winning streak just yet as he took the first round of Game 5. Although down the first round, ForeverKing used the corner positioning to his advantage and closed out the second round just as quickly. Knowing that the corner meant death for either player, Dragon managed to switch positions early on and proceeded to pick ForeverKing apart piece by piece, winning the grand finals 3-2! As more top contenders are eliminated, the lines between defending champions and hungry competitors seem to blur. Who will be next to take down a goliath of the Pro League? Tune into the next broadcast on Wednesday May 11 at 5PM PDT to find out, and be sure to grab your spot at the Season 3 Finals in Burbank, California while seats are still available! For all the latest information about the #MKXProLeague, be sure to follow ESL Mortal Kombat on Facebook and Twitter, as well as the official Pro League and Challenger Cup websites.